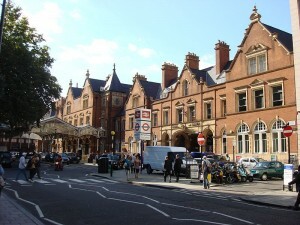 Marylebone is one of the most beautiful areas in Central London. It is bordered by Great Portland Street, Edgware Road, Marylebone Road and Oxford Street and it is home to Wallace Collection, Sherlock Holmes Museum, Oxford Street and Madame Tussauds. The area is served by the Marylebone railway station and by the following tube stations: Regent’s Park, Baker Street, Oxford Circus, Bond Street, Marylebone, Marble Arch and Edgware Road. The most renowned and impressive attraction in Marylebone is Madame Tussauds, a widely known wax museum with branches in major cities such as New York City, Las Vegas, Vienna, Amsterdam, Tokyo and Sydney. The founder of the museum was Marie Tussauds, a wax sculptor. It is an important tourist attraction and it displays waxworks of sports stars, royal and historical figures, infamous murderers and films stars. Marie Tussaud lived in 1761 in France, Strasbourg and she created the first wax figure in 1777. It was a figure of Voltaire. Later, she modelled many other famous people like Benjamin Franklin and Jean – Jacques Rousseau. Marie opened her own museum in 1835, on Baker Street. In 1884, it was moved to Marylebone Road. Throughout the years, Madame Tussauds has become a significant tourist attraction. Until 2010, it also included the London Planetarium. Some of the most memorable figures at the Madame Tussauds London are Alfred Hitchcock, The Beatles, Adolf Hitler, Charlie Chaplin, Elizabeth II, Prince Charles, Nelson Mandela and Johnny Depp. The Sherlock Holmes Museum is another great attraction situated in Marylebone, Central London. It’s located on Baker Street and it was opened in 1990. The town house that accommodates the museum has a Georgian style and between 1860 and 1936, it was a boarding house. Reportedly, Doctor Watson and Sherlock Holmes have lived there from 1881 till 1904. The Wallace Collection is another great museum located in Central London. It is home to a wide range of decorative and fine arts. The collection includes almost 5,500 items, such as paintings by Rubens, Rembrandt and Titian. In order to get rail transport from London Luton Airport to Central London, you have to take the train to West Hampstead and then you can take the Underground service to Central London. There are also other transfer options such as using a transfer service from London Luton Airport or West Hampstead to Central London. So as to travel by car from London Luton Airport to Central London, you must use the M1 motorway. London Luton Airport is 31.9 miles away from Central London. A journey by transfer from London Luton Airport to Central London with 247 Luton Airport Transfer is going to last around 1 hour and 5 minutes. The price for a transfer service from London Luton Airport to Central London starts from 49 GBP.